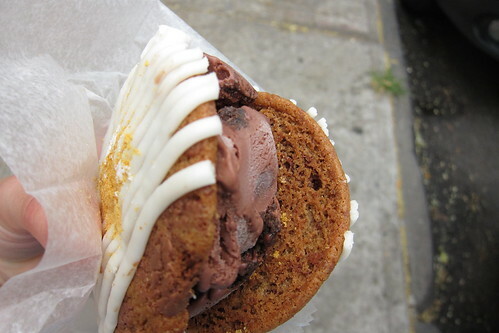 Blondie and Brownie: CoolHaus Ice Cream Sandwiches are Now $6?! I've realized I officially need to live somewhere with central air-conditioning. The uneven hot and cold in my apartment only makes me want to leave and be amongst the people! Except it's been hot out, so within a block or two I need something to cool me down. But I can hold out for a few blocks if I know that an ice cream sandwich is in store, like when CoolHaus decides to park in Williamsburg. Even if said ice cream sandwich comes with a bit of sticker shock! 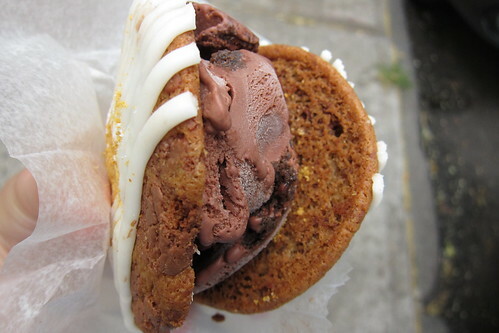 Coolhaus' trucks can be found roaming the city, so be sure to check their Twitter if you want to try this pricey treat. The good thing about coolhause is that it is always FREE--yes FREE--if you take down their skyscraper challenge in under 10 minutes. It's a joke. SO EASY. No need to EVER pay for coolhaus! Just do the challenge.